Sometimes you just need a basket in a specific size. And the more specific you get, the more difficult it is to find the one you want. But what if you could make the perfect size basket for a specific purpose? 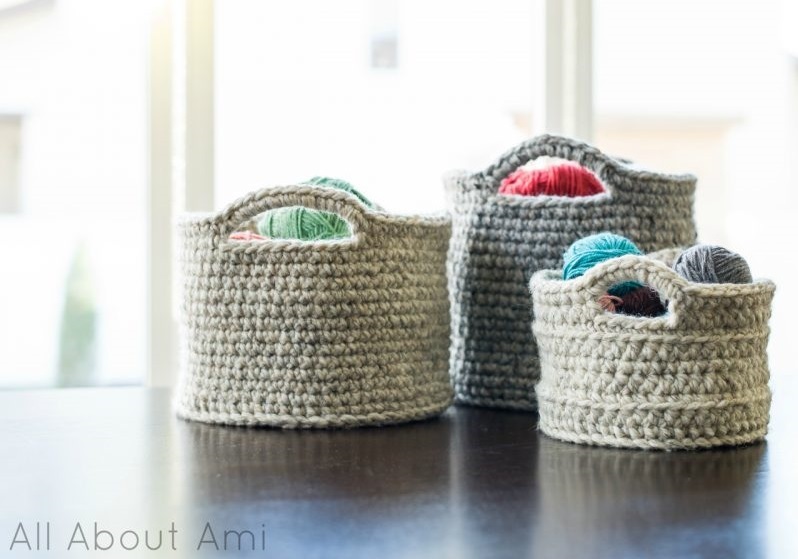 All About Ami has you covered with several free patterns for crocheted baskets in every size, ranging from simple one color baskets to the more complicated ombre effect basket. She’s also included her modifications to the patterns so you can make sure you have the exact size you need. You’ll want to use a super bulky yarn to ensure that the basket holds its shape, and in some cases, you’ll use two strands of yarn throughout the pattern. However, if you want to experiment, you can use a smaller weight yarn and simply add more strands (start with three or four) to make sure it stays a stiff texture that you can shape into a basket. One of the patterns recommends using Lion Brand Wool Ease Thick & Quick if you’re going to use a super bulky yarn. If you’re wanting to try the ombre basket, however, you’ll simply use four strands of a worsted weight yarn to get the effect you desire. Another thing to be aware of is the size of the crochet hook you’re using — too large, and the texture won’t be stiff enough to retain its shape. 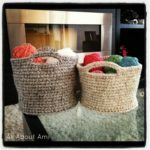 While it might seem like a good idea to use a larger hook with super bulky yarn, the basket might become more of a bag if you do. None of these patterns are overly complicated. All you need to do is check that your crochet hook and yarn weight are the right fit so that your basket doesn’t slouch or succumb to being pulled in all directions because of its contents. Once complete, a set of these baskets would make great gifts for the people in your life who love to organize. They also make a thoughtful welcome present. Of course, you can always keep them for yourself and use them to hold all your yarn, crochet hooks, and other craft supplies. Want to try your hand at making one or more sizes of these crocheted baskets? 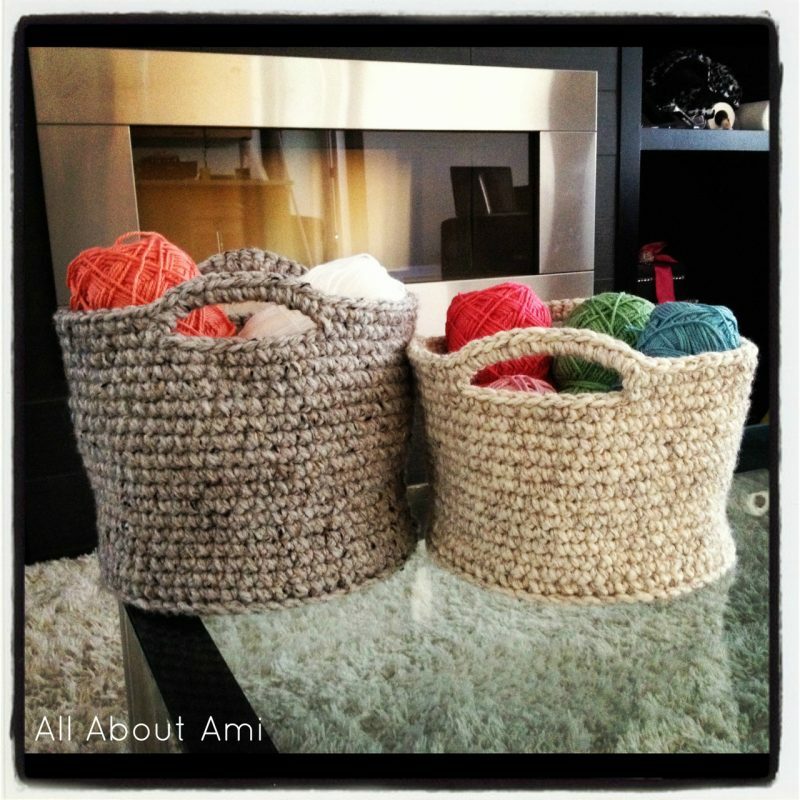 All About Ami has links to each pattern (whether you want small, medium or large) on her site.